It’s not often I get to go to gigs. That may sound ridiculous, for someone who gigs as much as I do, but it’s increasingly rare that I actually get to go and see a band just because I want to see them, not because I’m on the same billing. On Sunday, I headed down to the Vibe Bar with some stray members of Belleruche and Chris from the Shadow Orchestra to hear the Joe Acheson Quartet, fresh from Edinburgh. I absolutely loved their set – crunchy live electronica, live bass and violin with two (two!!) 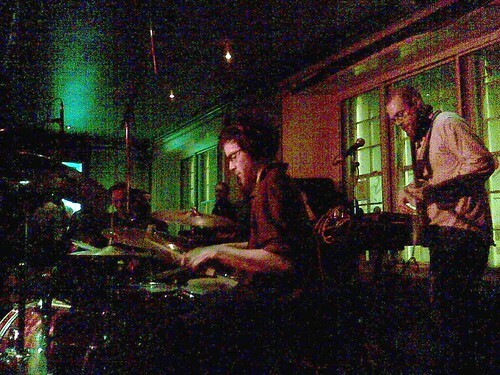 drummers and some seriously awesome beats. Sounds a bit like DJ Shadow, Bonobo, Red Snapper – that kind of thing. Lovely, atmospheric stuff that went down a storm in a packed bar. Go and check out their Myspace, to hear a bunch of their tracks and find out more. I love it when I find a band whose list of influences almost exactly matches mine (Claude Debussy, Red Snapper, Charles Mingus, DJ Shadow, Aphex Twin, Orbital, William Byrd, Steve Reich, Arnold Bax, Frank Bridge, Oskar Okros, Dave Brubeck, Luke Vibert, Lou Reed, Madlib, Maurice Ravel, Radiohead, Isaac Albeniz, DJ Premier, Sergei Rachmaninov, Gene Krupa, Bill Evans, Squarepusher, Mike Paradinas, Leftfield, Charlie Parker, Authechre, DJ Krush, Tortoise, Erik Satie, Boards of Canada, Wagon Christ, Buddy Rich, Gerald Finzi, 4hero, John Martyn, The Doors, FSOL, Jackson C. Frank, Ralph Vaughan Williams, Igor Stravinsky, Arvo Part, Cesar Franck, Louis Vierne, Lou Reed, Gabriel Faure, David Holmes…) – I’ll definitely be looking out for their forthcoming album. And watch this space for details of an exciting ‘gig exchange’ in the Autumn – The Shadow Orchestra are planning our album launch in London along with JAQ, and we’ll also be heading up to Edinburgh to play with them there.